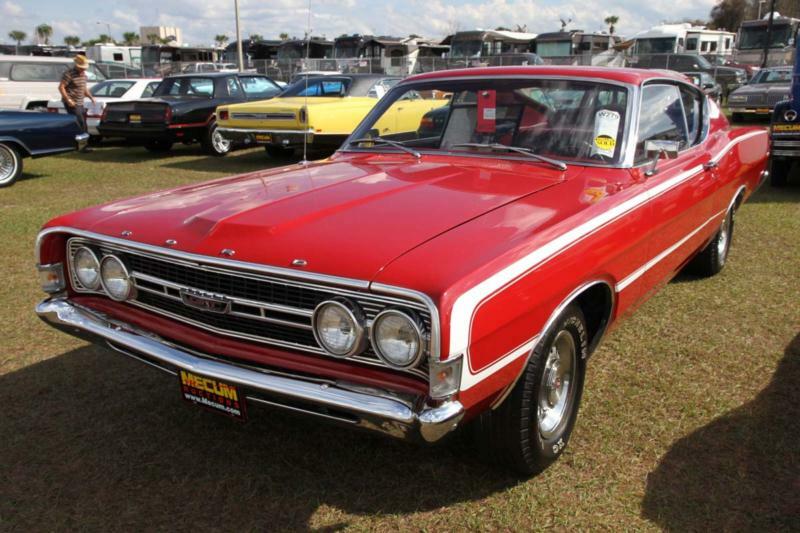 Initially known as the Fairlane Torino, Ford’s new mid-sized line was launched in 1968, with a GT convertible pacing the Indy 500. The cars never carried the Fairlane name and soon became known as Torinos. Offering a full range of coupes, hardtops and sedans, the GT line immediately gained attention for its handsome fastback body, which echoed the Mustang, but with an even more radical roofline. While only 5,317 Torino GT convertibles were, sold the fastback coupe notched up 74,135 sales, and the two-door hardtop a further 23,939. Engines ranged from a 210-hp, 302-cid V-8 to 325-hp/390-cid and 360-hp Ram-Air 428-cid mills. Both three-speed Cruise-O-Matic and four-speed manual transmissions were offered. The super-slippery fastback was an immediate hit with NASCAR and David Pearson took the 1968 championship. A Torino Cobra series was introduced for 1969 and the semi-sloping SportsRoof model would lend its lines to the Australian Ford Falcon of Mad Max fame. Meanwhile, the aerodynamic Torino GT Talladega Special was built in limited numbers for homologation and 754 were sold with the 428-cid Cobra Jet motor or the even more powerful 429-cid V-8. The full Torino line continued in 1970, merely replacing the Fairlane with small six-cylinder and V-8 motors, and sedan, coupe, and station wagon bodies. Collectors focused on the Torino GT and Cobra series. The semi-sloping GT coupe sold an impressive 56,819 examples, but there were only 3,939 convertibles, making them quite rare. The Cobra GT attracted only 7,675 buyers, despite a 360-hp, Ram Air 429-cid V-8 and optional four-speed transmission. Ford made few changes in 1971, save adding a luxury Brougham line. The high-performance wars were fading, and the GT recorded 31,641 sales, with 1,613 convertibles and 3,054 Cobra hardtops. Engines included 302-cid, 351-cid, and 429-cid V-8s. The Torino received a major facelift in 1972, with the grille and bodywork receiving mixed reviews from critics. The public voted with their pocketbook, however, and sales stayed strong. The Gran Torino took over from the GT and Cobra, with the two-door hardtop selling 132,284 units. The fastback coupe sold 60,794 units, but there were also two Gran Torino station wagons in the lineup. Bumper regulations meant new front sheet metal for 1973, but sales stayed strong as horsepower figures dwindled, and a luxury Brougham line was added. The Torino continued through 1976, and many of the last two-door hardtops have been painted in red-and-white Starsky and Hutch paint jobs. The optional 400-cid V-8 managed 158 hp, while the 460-cid V-8 developed 218 hp. Ford Torinos and Grand Torinos today are best remembered as stylish and more luxurious alternatives to more common muscle cars. They may not have the same performance as some of the eras icons, but they still deliver a wallop when correctly configured, and they typically sell at prices that make entry achievable for most enthusiasts. Click here to read Hemmings Motor News' Buyers Guide for the 1970-1971 Ford Torino GT. Click here to read Hemmings Motor News' Buyers Guide for the 1972-1973 Ford Gran Torino Sport.